Today is the anniversary of the passing of Stevie Ray Vaughan. A sad day indeed. As a tribute to the blues guitar icon, Modern Guitars Magazine has posted some previously unpublished photos (taken by Rick Landers) of SRV at the Beacon Theater, New York City on December 28, 1983. This is really cool. 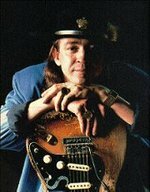 Modern Guitars Magazine has posted an interview with Stevie Ray Vaughan that has never been published in it's entirety before. It was conducted by Steven Rosen on October 29th 1985. The piece also features several previously unpublished photos of SRV by photographer W.A.Williams.